I love Harlan Coben, he’s one of my favourite authors. His books are so fast-paced and easy to read. ‘Fool Me Once’ is not one of my favourites. The main character, Maya Stern, is a disgraced soldier with PTSD whose husband and sister have been murdered. Due to this heavy subject matter, I felt the book lacked Coben’s usual lightness of touch and witty dialogue, which often make his books fun to read. The book starts with Maya seeing her supposedly dead husband playing with her daughter on a recording from her nanny cam. This leads her to investigate her husband and sister’s deaths. The theme of dead people returning from the grave is one Coben uses often in his books and it will be very familiar to his fans. It always sets up an intriguing premise for a book; however, in this book it felt like a missed opportunity. It was a pleasant tease to draw you into the book but the rest of the plot did not live up to the promise of the beginning and I thought the plot completely fell apart during the final climax. I was hoping for a much cleverer and more exciting conclusion to the book. While I appreciate a strong female lead, Maya is not a very likable character. Her parenting skills are abysmal. For example, her choice of next of kin for her daughter is an alcoholic.The book is told in third person, so she’s not exactly an unreliable narrator, but Coben chooses to omit a crucial part of her story in order to create a big reveal for the finale, so you feel a bit duped because the book would be completely different if we possessed all the facts that we should about Maya at the beginning of the book. As always with Coben, this is an easy, fun read but it does not live up to the standard of some of his best work. If you’ve never read one of his books try ‘Tell No One’ first, it is a near perfect thriller. It was Mother’s Day in the UK yesterday. My Mother’s Day treat was to spend the whole day pretending I’m not the mother of a one year old and to snuggle down and read a whole book in one sitting which I haven’t managed to do since I was in the hospital waiting for my daughter to be born. In honour of this momentous occasion, I picked a book by the same author, Rainbow Rowell, as Ireland in the hospital. Last year it was ‘Attachments’, this time it was ‘Fangirl’. From experience of her writing. I knew it would an easy, light, enjoyable read that I’d be able to get into and through quickly. I also wanted to read it because one of the characters is called Wren, which is my daughter’s name, although it turned out that that character was a bit of a cow. 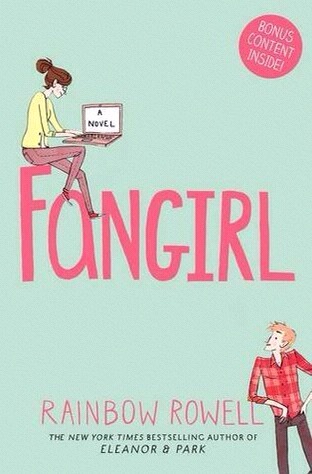 ‘Fangirl’ is the story of twins Cath and Wren, who start university together. They’ve always been close but Wren wants to strike out on her own, leaving the more introverted twin Cath feeling nervous and scared about finding her place at university on her own. Cath is obsessed by a Harry Potter style series for which she writes fan fiction. Gradually she makes friends, falls in love and discovers that real life can be as rewarding as her fantasy world. I enjoyed this book, particularly the beginning. I’m very introverted so I found Cath very relatable. However, I felt like the story lost a bit of momentum once Wren got a love interest; Levi was a bit too good to be true and I wasn’t really convinced by their relationship. He is so much more mature than Cath, and she is still such a child I found their relationship a bit creepy even though he is always the perfect gentleman. Also, I was disappointed that the character of Nick wasn’t explored more, I found him more interesting than Cath home life drama with her parents. It’s a sweet book, but not quite as emotionally punchy and gripping as ‘Eleanor and Park’ which is definitely Rowell’s best book so far. I also didn’t really enjoy reading the sections of fan fiction and excerpts from the fantasy series which Cath is obsessed by. They felt a bit like padding and not all that well written. It’s interesting that Rowell’s latest book ‘Carry On’ is set in that world, I’m going to read it but I find it hard to imagine it working very well based on the bits of the story interspersed through this book.